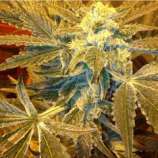 Here you can find a strain description about Healing Fields and also some user-based reviews and infos directly from the SeedFinder (if available). You can also find the offers and auctions here if Healing Fields cannabis seeds are on stock at MyCannapot right now. Healing Fields' mother, Cindy La Pew from Gage Green is a pineapple skunk that makes you feel light as a feather. The finest tropical aromas Gage Green had ever come across. She retained the pineapple and inherited the classic road kill grease of the G13 Skunk. Full of flavour and potency, Gage Green paired her up with the Freedom Baby for balance. Discover medicinally-minded herb with clear and balanced effects like the Freedom Baby series. Every phenotype increases creativity and mental awareness while pushing out physical pain. The Healing Fields is a fast finisher, full of flavour and vigour. Buy Healing Fields now at MyCannapot!